Jeanne Boyarsky, OCA/OCP 8, has worked as a Java developer for a bank in NYC for 13 years where she develops, mentors and conducts training. In her free time, she is a senior moderator at CodeRanch and works on the forum code base. 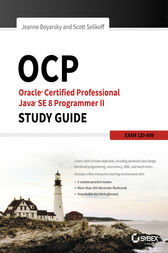 Scott Selikoff, OCA/OCP 8, has been a professional Java Enterprise developer for over 15 years. He currently operates Selikoff Solutions, LLC, which provides software consulting services to businesses in the tri-state New York City area.